Stop what you are doing right now (except for reading this post), because I have an awesome concealer you should check out. 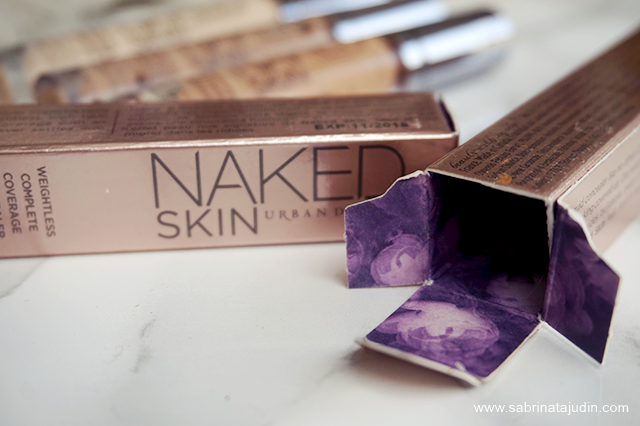 I have raved and recommend my friends with this concealer and it is the UD Naked Skin Weightless Complete Coverage Concealer. I am on my 3rd bottle now and I am loving it. It somewhat pretty pricey but I just can't get enough of this concealer. This concealer was released in 2014 if I am not mistake. It said that this concealer is an innovative, high-coverage concealer that provides build able, weightless coverage and leaves an invisible, Naked Skin finish. 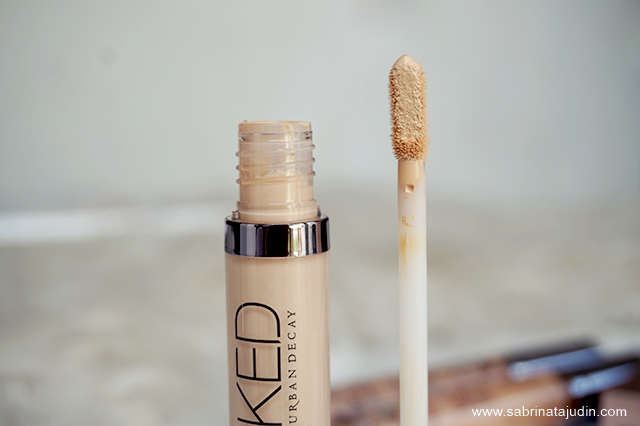 They also have these in the color correction version called the Naked Skin Color Correcting Fluid. Same bottle but with different type of hues. What I like about it. Full coverage but feels light on my skin. Just like the name itself. It is super creamy but easy to blend. I love the applicator. It is not too stiff and it is flexible (in a way it does not drag your skin when apply). It makes the application gentle on to my skin. This concealer is high coverage and last pretty long hours. Cover up my under eye and dark spots perfectly and beautifully without creasing or cakey feeling (even with powder on top). What I don't like about it. I still can't find my perfect shade and it's pretty pricey. The first shade I got to try is the Medium Neutral. It is a bit dark for me overtime as it oxidize. I have to use a darker foundation to make sure it looks natural and blend to my skintone. 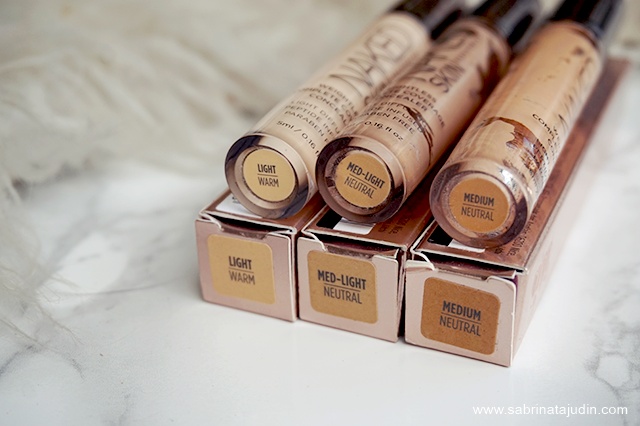 Then I purchase my 2nd bottle in the shade Med-Light Neutral. The perfect shade for me! But it get a bit darker after a few minutes. But this still looks good on my face but not on my undereye. As I like a brighter shade for my under eye for that lifting look. Then I go and purchase my 3rd one in the shade Light Warm. Pretty okay for my under eye, a bit too light pulak. I think I have to mix abit of the Light Warm and Med-Light Neutral. 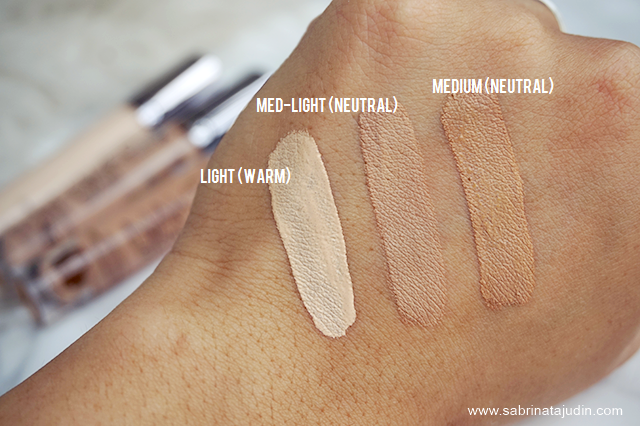 Gosh its such a good concealer but even in 12 shades option I can;t seems to blend in a good one! Overall & Recommendations. If you wanna find that one good concealer to cover up your dark spots and under eye. Go for this! You might wanna buy a lighter shade for your under-eye for that bright effect and a one tone lighter shade for your face as this will oxidize and match your skin perfectly. I hope they will come out with more shades and I think they are as I saw a teaser in the insta feed. Next I really want to try the NARS Creamy Radiant Concealer that people said to be comparable to this one too. 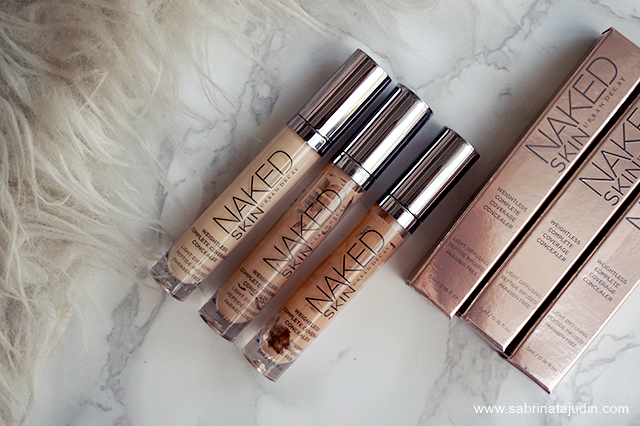 I really love UD Naked Skin foundation and their concealer too. I agree it's hard to find the concealer that could match with our skin tone but I mostly use the concealer as an under eye concealer as it doesn't leave any harsh lines or dry patches on the skin. Good for dry skin. Love them so much!.